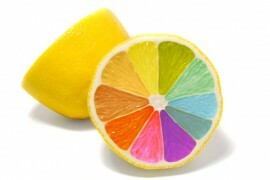 to dye colorless products, as well as to ensure their attractive appearance and color diversity. Both natural and synthetic substances are used as food colorings. Fresh or dry milled plant raw materials, juices, confiture and other similar products used for tinting of food do not fall into colorings and are not considered to be food additives, as they can be used as food products or typical food ingredients. Bleachers (bleaching substances) prevent and eliminate the undesirable dying of a product by means of a chemical reaction with its components. Color stabilizers (fixing agents) preserve the natural color of food products during their processing and storage or delay the undesirable change of color. There is a selection of synthetic colorings. They are used both individually and in mixes with each other. Coloring mixes are used to obtain colors and tints which cannot be obtained using individual colorings. Natural food coloring, antioxidant; it is a provitamin A. When used it gives golden yellow to orange yellow color to products. Β-Carotene is very widely used in the food industry as a coloring and provitamin A in order to enrich food products.